An electric-powered climber spacecraft rides up the space elevator. Reach for the sky. Image depicts key elements of a space elevator, from top to bottom. Climber ascends space elevator, heading spaceward from its aeroshell. 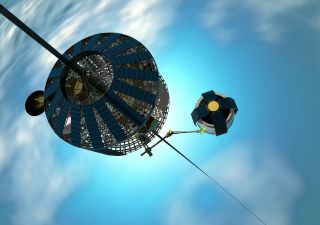 Space elevator makes use of an ocean platform to connect Earth with space. "People will laugh and ask why did we ever do space rockets…it's a dumb idea," Swan said. "Space elevators are the answer if we can make them work. Why would you do anything else?"